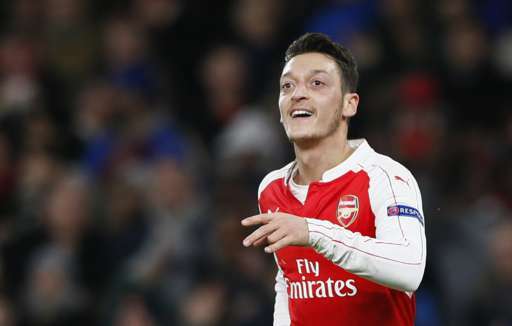 Arsenal 3 – 0 Dynamo Zagreb – A Return to Form. Match Review. New Author 14th January 2018 Arsenal, champions league, europe, Exclusive, fans, reviewTagged form, injuries, ozil, Sanchez, zagreb1 Comment on Arsenal 3 – 0 Dynamo Zagreb – A Return to Form. Match Review. This match was met with a lukewarm response from Gooners. A tepid showing so far in the group – Bayern Munich at home aside – and a possibility of a Europa League campaign very much on the horizon left Arsenal fans with mixed feelings regarding last night’s game versus Zagreb. A win and the continuation of our Champions League campaign definitely set the record straight and a welcome return of form saw the negativity sent back to the shadows once more. We always want victory, that goes without saying, but with the Premier League seemingly obtainable, a title challenge is very much in demand. Arsene Wenger is of the opinion that his squad is capable of fronting a dual challenge, and with a full squad at his disposal, he’d be correct. Seeing as Arsenal are hobbling through November with a raft of players on the treatment table, priorities must be put in place. The wounded are returning for Arsenal though. Hector Bellerin returned in the weekends defeat to West Brom and Aaron Ramsey, after missing six games, was named on the bench for this match. The Welshman has been sorely missed on the right and it was thought there may be a chance he would instantly return to the side. Thankfully Ramsey was named amongst the substitutes and Joel Campbell was given another chance to nail down a place in the squad. The line up was strong as the thought of an early exit forced Wenger’s hand. Giroud started in the sole striker position, with Sanchez, Ozil and Campbell completing the attacking positions. The much-discussed ‘Coquelin’ role was taken by the experienced Mathieu Flamini, so Wenger’s vocalised thought of slotting Calum Chambers into the position stayed as a mere hypothesis. The worry remained though, that whatever result was achieved on the Emirates would be rendered moot by events taking place in the Allianz Arena. Olympiacos could take the second qualifying spot by snatching a draw against Bayern, but the angst was removed at an early stage as Bayern put the Greek side to the sword in the first half, firing in three unopposed goals and thus removing the majority of doubt. If Arsenal wanted to avoid a group stage exit, then fate was placed back in their hands. The major obstacle now was recouping the form which has mysteriously vanished since Arsene Wenger took the Manager of the Month award for October. The Gunners started well, with possession kept well and a half decent tempo to start, despite a large amount of empty seats in the stadium. Nacho Monreal and Joel Campbell in particular, seemed vibrant and posed the majority of problems that Arsenal threw at Dynamo. Flamini was his usual Flamini-self, throwing himself into tackles and intent on letting the opposition midfield know of his presence. On the 28th minute, the deadlock was broken. It was a rapier quick counter attack after a rare foray from Dynamo into Arsenal territory, with Olivier Giroud helping out to defend and a deft flick saw Mesut Ozil on the break. The German saw Alexis blazing a path forward and found the Chilean on the run. From there, it was the Sanchez show as he carried it forward a large distance before putting a cross into the box. His ball into the area found the ‘lazy’ Ozil – who had ran the marathon with Sanchez and was in the box. He met the ball with a diving header and Arsenal had a goal lead. Five minutes later, it was two. Nacho Monreal continued his excellent display by cutting out an unwise pass from a Dynamo defender and after beating his man, put in a cross which left Alexis with just the keeper to beat. His finish was unerring and Arsenal had doubled their lead. What was especially comforting was the return of a semblance of form from our mercurial Chilean. He was at his effervescent best in the first half and his fatigue seemed no hindrance. With Arsenal seeing out the rest of the half comfortably though, the barometer of fans opinion was that an early bath to protect Alexis would be the way forward. Someone didn’t inform Sanchez of the plan though, as the second half saw the Sanchez show receive an encore. One moment highlighted this, with the Chilean dribbling past four Dynamo players and looking fresher than he had been in weeks. Sanchez still remained when the much heralded return of Ramsey occurred in the 67th minute. The Welshman took to the field in place of an off colour Olivier Giroud and the call from Arsene Wenger to leave Alexis on the field was rewarded on the 70th minute. 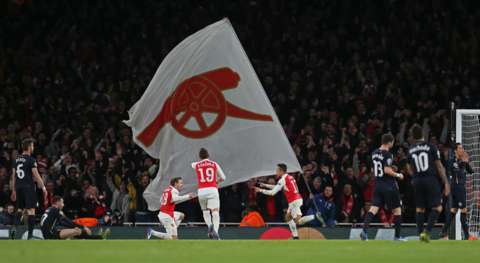 Joel Campbell – who was having his best game in an Arsenal shirt – played a sumptuous ball into the feet of a lurking Alexis and with one touch he rounded the Dynamo keeper Eduardo and smashed the ball high into the net. It was so good to see Campbell having a fruitful game and while doubts will still remain as to his Arsenal longevity, he showed that he is capable of producing the goods. The pass which fed Alexis was enabled with only a glimpse and was Ozil-esque. Alexis was showing his better side after a dry spell, and Santi Cazorla also seemed to be emerging from a series of poor performances of late too. He looked to be back to the player who is involved in both ends of the pitch and whose touches can bamboozle his markers with a mere shift of a shoulder. The two-footed Spaniard was running the show and when in form and in tandem with Ozil, this duo is nigh on unmatched in terms of potential damage to opponents. Santi was taken off shortly after, as well as Hector Bellerin, as Calum Chambers was given his bow in midfield and Debuchy came on to replace Hector. Alexis remained on the field and the much vaunted Jeff Reine-Adelaide remained on the bench, much to Gooner’s displeasure, but I can only imagine the wrath that Sanchez would wreak if he missed out on even a minute of physical exertion. I imagine he does squats whilst drinking his morning tea. He wasn’t finished however, and what would have been the coup de grace was a link up between him and Ozil which had social networks purring and if Ozil’s improvised backward header had found the net then a rival for Jack Wilshere’s team goal against Norwich would have been doing the rounds on everyone’s Twitter timeline’s. The final whistle blew and a 3-0 scoreline was the reward for a display which evidenced what a return to form brings to Arsenal’s table. Passing which zips rather than strolls, movement which is full of intent rather than ending in cul-de-sac’s. Nacho Monreal, Joel Campbell and Santi Cazorla put on a fantastic show, with Nacho in my humble opinion, grabbing the award for Man of the Match. He was impassable and in attack was instrumental. Our Champions League hopes now rest on a trip to Athens. An intimidating venue and packed with pressure. If Alexis and Ozil can reproduce even a drop of the magic they served up during these ninety minutes, then European progression will be assured.